Here is the list of the hotels near Droyes. Book your hotel near Droyes today, Thursday 09 May for the best price, reservation and cancellation free of charge thanks to our partner Booking.com, leader in on-line hotels reservation. Below here is the list the 50 closest hotels of Droyes, sortable according your criteria. You will find the position of these accommodations on the Droyes hotels map. Located 6 km from the Der Lake, Gite Le Courlis is located in Outines and provides a terrace and fenced garden. There is a full kitchen with a dishwasher and a microwave. Free WiFi is available in the public areas. Featuring exposed wooden beams, Gite Le Courlis features two bedrooms and 2 bathrooms, one of which offers a walk-in shower. You can enjoy garden view from all the rooms. At Gite Le Courlis you will find barbecue facilities, a games room and a lounge with fireplace. An array of activities can be enjoyed on site or in the surroundings, including cycling and hiking. Aquatic activities can be enjoyed at the Der Lake. The property offers free parking. Set in a planted garden, this guest accommodation is just 1.5 km from Der-Chantecoq Lake and 2.5 km from Outines. It offers guest rooms surrounded by nature and woods. All the rooms at Au Milieu de Nulle Part include a bathroom and free Wi-Fi and they offer a garden view. Breakfast is served every morning and the hosts can prepare traditional dinners upon prior reservation. Many activities are available at Au Milieu de Nulle Part, such as fishing, bird watching and hiking with the donkeys. Vitry-le-François Train Station is 20 km away. Gite Insolite "La Roulotte des Elfes", Au Milieu de Nulle Part is set in the countryside outside Outines, just 1.5 km from Der-Chantecoq Lake. It proposes a traditional wooden caravan with free Wi-Fi internet access. The caravan opens onto a private terrace with views of the forest. It includes a kitchenette and a dining area, and the en suite bathroom is fitted with a shower, toiletries and a hairdryer. Breakfast is available upon request, and there is an electric barbecue to make grilled food. Guests can pet the property’s donkeys or go fishing, hiking and birdwatching on site. Free parking is possible at La Roulotte des Elfes, and Vitry-le-François Train Station is 20 km away. The property is 32 km from Saint-Dizier. La Cabane aux Secrets - Au Milieu de Nulle Part provides a tree house set within the woods, just 1.5 km from Der-Chantecoq Lake. Several activities are available on-site, including fishing, bird watching and hiking with donkeys. The tree house features a terrace and a CD player. The private bathroom is fitted with a hairdryer and free toiletries. You can also prepare meals using the equipped kitchenette La Cabane aux Secrets - Au Milieu de Nulle Part offers free private parking and Outines is 2.5 km away. Vitry-le-François Train Station is 20 km from the property. La Halte is a holiday home with a garden, set in Villeret, 2 km from Lentilles Church and 500 metres from the GR 654 Hiking Route. 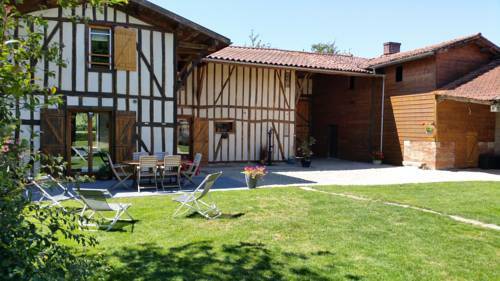 The property boasts views of the garden and is 43 km from Troyes. Towels and bed linen are featured at La Halte. Extra facilities at the property include Kansu bowl foot massages which are available upon prior request. Joinville is 41 km from La Halte, while Colombey-les-deux-Églises is 36 km from the property. You can engage in various activities, such as fishing and hiking, and the Etang de la Horre Nature Reserve is 5 km away. The nearest airport is Vatry International Airport, 45 km from La Halte. Featuring free WiFi and a terrace with garden views, Meublé de tourisme Le Gilliard is a holiday home, located in Chavanges. The property is 44 km from Troyes and free private parking is available. An oven and a toaster can be found in the kitchen and there is a private bathroom. Other facilities at Meublé de tourisme Le Gilliard include a sun terrace. Guests can enjoy a 90-minute Reiki session upon prior reservation. Joinville is 43 km from Meublé de tourisme Le Gilliard, while Colombey-les-deux-Églises is 39 km from the property. Vatry International Airport is 41 km away. Guest accommodation Montmorency-Beaufort Preferred hotel ! Set in Montmorency-Beaufort, La Lavandiere Spa Jacuzzi provides accommodation with a terrace and free WiFi. The holiday home is 17 km from Port-Dienville lake and 35 km from Forêt D'Orient lake. The provided holiday home is equipped with 1 bedroom, a living room, a kitchenette, a dining area, and 1 bathroom with a shower. A flat-screen TV is featured. A continental breakfast is served daily at the property. Speaking English and French, staff will be happy to provide guests with practical guidance on the area at the 24-hour front desk. The holiday home offers a barbecue. Guests at La Lavandiere Spa Jacuzzi can enjoy cycling and hiking nearby, or make the most of the garden. Saint-Dizier is 45 km from the accommodation, while Montier-en-Der is 20 km from the property. The nearest airport is Châlons Vatry Airport, 57 km from the property. Located in the village of Écollemont, this holiday home is situated next to Der-Chantecoq Lake. Free WiFi is provided throughout the property. The kitchen has a dishwasher, an oven and a microwave, as well as a coffee machine and a kettle. A flat-screen TV with satellite channels and DVD player is offered. The holiday home features free WiFi throughout the property. Guest have access to a terrace and a garden. The area is popular for hiking and cycling, 5 bikes are available for free use at the property. Saint-Dizier is 20 km away while Colombey-les-deux-Églises is 59 km from Le Charme. Free private parking is available on site. Le Bois Flotté holiday home is set in a house typical of the Champagne region, in Arrigny. Barbecue facilities are provided in the private garden, and Camping Swin Golf Club is only 350 metres away. With 2 bedrooms, this holiday home will provide you with a TV, a Nintendo Wii games console and free WiFi in the living room. The bathroom includes a bath, while a washing machine is also provided. In the kitchen you will find self-catering facilities such as an oven, microwave and fridge-freezer as well as a dining table. An array of activities can be enjoyed in the surroundings, including cycling, horse riding and hiking. Free parking is available on site. This holiday home is 90 km from Reims - Prunay Aerodrome Airport. Le Québec is situated in Arrigny and offers barbecue facilities. Guests may enjoy free WiFi. This apartment is equipped with a kitchen, a flat-screen TV, a seating area and 1 bathroom with a bath or shower. There is a garden at this property and guests can go cycling and hiking nearby. Joinville is 45 km from the apartment. The nearest airport is Châlons Vatry Airport, 55 km from le Québec. Guest accommodation Isle-sur-Marne Preferred hotel ! Isle aux pêcheurs is located in Isle-sur-Marne, near the Der Lake. Surrounded by a 400-m2 garden, it offers BBQ facilities and free parking. The accommodation includes a living room with a flat-screen TV, a dining area and a fully equipped kitchen with a dishwasher and a microwave. The bathroom is provided with free toiletries. Cycling, hiking and fishing can be done in the property’s immediate surroundings. The property offers free parking. Châlons-en-Champagne is a 50-minute drive away and Troyes is 1 hour’s drive away. Bed and Breakfast Hauteville Preferred hotel ! Sente des Vignes provides a hot tub, as well as accommodation with free WiFi and a kitchenette in Hauteville. The accommodation features a spa bath. Fitted with a terrace, the units feature a flat-screen TV and a private bathroom with shower. An oven is also featured, as well as a coffee machine and a kettle. A continental breakfast is served daily at the property. If you would like to discover the area, cycling is possible in the surroundings. Joinville is 47 km from the bed and breakfast. Châlons Vatry Airport is 58 km away. Featuring accommodation with a terrace, Gîte La Sente des Vignes is located in Hauteville. Guests staying at this holiday home have access to a fully equipped kitchen. The holiday home has 3 bedrooms and 1 bathroom with a bath. A flat-screen TV and a DVD player are offered. Joinville is 47 km from the holiday home. The nearest airport is Châlons Vatry Airport, 58 km from the property. Offering a garden, La Fuste des Garceaux is set in Orconte in the Champagne - Ardenne Region, 14.5 km from Lake Der-Chantecoq. Free WiFi is featured throughout the property and free private parking is available on site. Each room at this bed and breakfast features bathroom with bathrobes, free toiletries and a hairdryer. There is a shared lounge with a TV and a PS3 game console at the property. The area is popular for cycling and hiking. Joinville is 37 km from La Fuste des Garceaux, while Saint-Dizier is 13 km from the property. Vitry-le-Francois is 18 km away. La Marcandine is located in Perthes and offers a casino and barbecue facilities. Providing free WiFi, the property also has a garden and a shared lounge. The holiday home has 1 bedroom, a flat-screen TV and a fully equipped kitchen that provides guests with an oven. The holiday home offers a children's playground. Hiking can be enjoyed nearby. Joinville is 41 km from La Marcandine. The nearest airport is Châlons Vatry Airport, 59 km from the accommodation. Hotel Saint-Léger-sous-Brienne Preferred hotel ! This hotel is set in Saint-Leger-sous-Brienne, by the Brienne-le-Château Airfield. Guests have free Wi-Fi internet access and are invited to watch TV in the lounge area or relax in the garden. Each of the soundproofed rooms includes a flat-screen TV and a telephone. The rooms feature parquet flooring and are equipped with work desks and en suite bathroom facilities. Breakfast can be enjoyed every morning in Hotel Air-lane’s breakfast area or in the comfort of guest rooms. Ironing facilities and hairdryers are available upon request. Free private parking is provided on site and skydiving courses and helicopter rides are organised at the airfield. The hotel is 40 km from Troyes and a 45-minute drive from the Der-Chantecoq Lake. Gite Du Lac Der Grue is located in Bignicourt-sur-Marne and is set within a 750 m² closed garden. There is also a terrace, outdoor furniture and BBQ facilities. The house features 4 bedrooms, a large living/kitchen area, 2 bathrooms with shower and 3 separate toilets. Guests can relax by the fireplace during the winter months and firewood is provided from November to March. Grocery shops and convenience services such as a bakery and pharmacy can be reached within 3 km of the property. Guests can walk or cycle alongside the River Marne or Marne-au-Rhin Canal, which is just 100 metres from the property. Fishing and nautical activities are also possible. Disneyland Paris is 1 hour 30 minutes’ drive from the property and Nigloland is a 45-minute drive away. Annexe le Champenois is located in Thiéblemont-Farémont and features a casino, a terrace and a shared lounge. The property has a bar, as well as a restaurant serving French cuisine. Free WiFi is included. At the hotel, every room is equipped with a desk, a flat-screen TV and a private bathroom. Every room comes with a kettle, while some have a balcony. A continental breakfast is served every morning at the property. Châlons-en-Champagne is 48 km from Annexe le Champenois. The nearest airport is Châlons Vatry Airport, 54 km from the property. Holiday home Grande Rue - 2 is situated in Thiéblemont-Farémont. This property offers access to a balcony. This holiday home comes with 4 bedrooms, a satellite TV, and a kitchen. The holiday home offers a barbecue. Châlons-en-Champagne is 47 km from Holiday home Grande Rue - 2, while Joinville is 50 km away. The nearest airport is Châlons Vatry Airport, 53 km from the property. This charming guesthouse sits in the heart of Champagne, 5 km from Brienne-le-Château and a 5-minute drive from Port Dienville. It features a restaurant with a large flower-filled terrace. The restaurant serves traditional French cuisine with regional specialties, and there is also a bar. The Auberge De La Plaine serves a daily buffet breakfast, which can be enjoyed on the terrace, in the dining room by the fireplace, or in the privacy of the guest rooms. The Auberge De La Plaine offers guest rooms equipped with free Wi-Fi access and satellite TV. Each is individually decorated and comes with a private bathroom. The Auberge is located in the village of La Rothière, which is just a 10-minute drive from the Auzon-Temple Lake. Troyes is a 40-minute drive away. Ferme du Mont Morêt is situated in Courdemanges and offers a garden, a terrace and a bar. Guests have access to free WiFi. The 1-bedroom apartment is equipped with a living room with a flat-screen TV, a fully equipped kitchen with an oven, and 1 bathroom. The daily breakfast offers continental, buffet or vegetarian options. If you would like to discover the area, cycling is possible in the surroundings. Châlons-en-Champagne is 39 km from the apartment, while Saint-Dizier is 32 km away. The nearest airport is Châlons Vatry Airport, 40 km from the property. Set in Dienville in the Champagne - Ardenne region, La Simonette features a terrace and garden views. Providing free WiFi, the property also has free bikes, barbecue facilities and a garden. This air-conditioned chalet comes with 2 bedrooms, a fully equipped kitchenette, a dining area and a satellite flat-screen TV. The chalet also features 1 bathroom with a shower. The reception can provide advice on the area in order to help guests plan their day. Guests can go fishing or hiking, and the property offers a bicycle rental service. Troyes is 38 km from the chalet, while Colombey-les-deux-Églises is 36 km away. The nearest airport is Châlons Vatry Airport, 72 km from La Simonette. Below here is the hotels map of Droyes. Names and details of Droyes hotels can be shown on the map clicking on the prices icons.